Take exit 170B to Rt 309 north to exit 6, Luzerne. At end of ramp, go straight under the overpass and bear left onto Grove St (as you go up the hill). From Grove St, continue to third stop sign and make a left onto Pringle St. Continue on Pringle St to Zerby Ave. Turn right on Zerby. The church is located on the left, and the parking lot is across the street from the church. The church is handicapped accessible, with an elevator installed. 4:00 PM Great Vespers and Confessions. 10:00 AM Divine Liturgy (9:00 AM from Memorial Day through Labor Day weekends). Confessions are heard before all scheduled Vesper/Vigil Services, before Divine Liturgy and by appointment. The early Orthodox Christians of Edwardsville parish came from Russia, Galicia and Carpatho-Russia. They attended Holy Resurrection Cathedral of Wilkes-Barre. Looking to the future and foreseeing the need of their parish a committee was formed and the first step toward their ultimate goal was taken in 1907 when a piece of property was purchased on Short St and a school building was erected. This building was to become the center of all educational, cultural and social activities. Fr Alexis Toth, Rector of Holy Resurrection Cathedral appointed his assistant, Fr Gregory Shutak, to conduct evening classes in religion and Russian culture. In the year 1910 a special meeting was held during which a decision was reached to petition Archbishop Platon for the establishment of a parish in Edwardsville. On the fifth day of June, Fr Shutak and Fr Basil Oranovsky served Vespers, after which a meeting was held and a resolution read from Archbishop Platon officially opening the new parish and appointing Oranovsky as pastor. Following the election of the first parish council officers, St John the Baptist was chosen as the Patron Saint of the new parish. Initially divine services were conducted in the school building on Short St and in early 1911, a suitable site for a church edifice was found on Zerby Ave. On March 24, 1912, the laying of cornerstone was performed by Bishop Alexander, vicar to Archbishop Platon. The church was completed during the summer of 1913 and was solemnly consecrated on Labor Day by Archbishop Platon. On April 10, 1918, Fr Anthony Repella was appointed as pastor. It was during his tenure that a new rectory was constructed in 1939. Throughout the years changes in pastoral guidance along with physical improvements have occured. The installation of an elevator in 2004 allows us to be handicapped accessible. What hasn’t changed is the deep spiritual commitment of St John’s parishioners. We invite those travelling through the area and those who may have local affiliations to visit and worship with us. 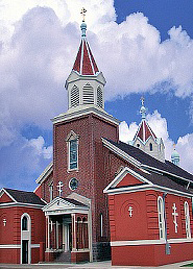 During the current year (2010-11), the parish is celebrating its Centennial and that of its Temple with a series of concerts, lectures, monthly prayer Services of Thanksgiving (Molebens) and Memorial Services for its pastors, choir directors, Church School Teachers, Parish Council Members, and others who have served our parish, as well as for deliverance from floods and other traumatic events. The observance will culminate in a Hierarchical Divine Liturgy and Banquet on June 18, 2011. Those interested in any of these events should consult the parish website or call the Rectory.